This pretty little church has the air of being an assemblage of late 19th century agricultural buildings on the edge of Downham Market town centre. It has an organic feel to it: here is the church, the parish hall, the presbytery and a bell tower all on the same site. In fact, this group is the result of almost seventy years of buildings being extended and added to, the church itself being enlarged rather magnificently as recently as 2006, as the plaque on the wall records. The simple 1941 hall church has been extended sideways, and the focus to the altar turned through ninety degrees. 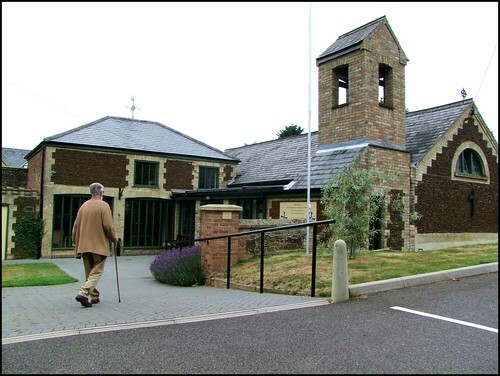 The new church is about three times as big as its predecessor, reflecting the unprecedented growth in Catholic congregations in East Anglia in recent years. The original church retains its simple altar, which now forms a shrine to Our Lady of Walsingham. There is Sacred Heart shrine at the opposite wall. The clean white lines of the new sanctuary reflect the current fashion in East Anglia, being reminscent of other renewed churches at Walsingham and Poringland. Perhaps only the low roof spoils the effect: I couldn't help imagining it with a barrel-vaulted roof to match that of the old church instead. Actually I had to do a little bit of imagining anyway, because we arrived here about half an hour after the Saturday morning Mass had ended, and never in my whole life have I stepped into such a rich and dense cloud of incense - and I am a Catholic myself, let me remind you. It was all very pleasing and atmospheric, even if my photographs have come out as if the film has been fogged by a leaky camera case.